Banagher's Paul Cartin breaks away from Steelstown duo Mickey McKinney and Ben McCarron during Sunday's Intermediate Championship semi-final. Banagher cruised to a Derry Intermediate Championship final meeting with Ballymaguigan following a facile 14-point victory over a Steelstown side that finished with only 13 men. The city men were outclassed from start to finish, only briefly threatening to make a game out of it when Gareth Logue's superb first half goal brought them level. They even edged in front straight seconds later but that lead lasted only 60 seconds and thereafter Steelstown struggled to contain a rampant St Mary's side. When the ball was thrown in to set proceedings underway, the Steelstown 15 showed five changes from the side listed to start but if that was tactic meant to confuse the opposition, it was the Brian Ogs rather than Banagher who looked bemused in the opening exchanges. Backed by a considerable breeze, St Mary's dictated the pace. Steelstown kept three men inside but that only served to stretch the game and the Brian Ogs defence couldn't cover the spaces as Banagher got runners through the city side's '45' far too easily. Logue's goal was cancelled out by Mark Lynch's superb soccer style finish to give Banagher a 1-13 to 1-05 lead at the break, a margin that didn't flatter the championship favourites. Steelstown did get the perfect start to the second half when Mickey McKinney broke down possession for Jacob Duffy to hit the net inside 20 seconds of the restart but that optimism lasted barely a minute as a second yellow card for Dairmuid Baker saw Steelstown reduced to 14 men. From there, it was only a matter of how many Banagher would win by, the second half resembling something of a training session for Banagher. The Brian Ogs kept battling but a late red card for Ryan Devine merely compounded their misery in a game Steelstown will want to forget as quickly as possible. Ironically the city side were first on the scoreboard with an Emmet Deane point but that was quickly cancelled out by Tiarnan Moore. Mickey McKinney, starting his first Championship match since the 2016 final traded scores with Conor Feeney but there were already alarming holes emerging in the Steelstown defence. Peter O'Hagan, Shane Farren (2) and Mark Lynch all hit points as Banagher began to assert their superiority before 1-02 inside two minutes brought Steelstown back into the game. Ben McCarron scored a nice point before Ryan Devine picked out Mark Foley with a quick free. Foley spotted the supporting run of Logue on his inside and provided the pass for the nippy forward to flash an excellent finish across Daryl McDermott in and into the net. When McKinney tagged on another point for a 1-04 to 0-6 lead, it looked like Steelstown had got to grips with the game. It was too easy for Mark Lynch to pick out Shane Farren with a short free seconds later to level and when Gavin O'Neill (2), Mark Lynch and Brian Og McGilligan made it 0-11 to 0-4 it looked ominous. That ominous gap went from 'considerable' to 'unlikely' four minutes before the break when O'Neill's pass bobbled through the Steelstown rearguard for Mark Lynch to latch on to and finish with a fantastic, clipped soccer-style chip over the advancing Marty Dunne. Lynch tagged on another free and even though Foley grabbed Steelstown's first score for 17 minutes, a Peter O'Hagan free rounded off the half to ensure a 'double score' lead of 1-13 to 1-05. Jacob Duffy's goal could have made the game interesting but followed as quickly as it was by Baker's dismissal meant the wind was taken out of the Steelstown sails before they managed to get moving forward. It had been a tall order with 15 men; it was impossible with 14. Banagher controlled the game thereafter, a superb Tiarnan Moore run down the right setting up Niall Moore for Banagher's second goal and their third followed only two minutes later. This time Naill Moore turned provider for Gavin O'Neill who finished emphatically but the game has long since finished as a contest. A fourth major duly arrived in injury time, as did Devine's red card for an altercation with Peter O'Hagan. It mattered little though. Banagher have been most people Intermediate Championship favourites before a ball was kick and they did nothing to dispel those opinions with this impressive display. 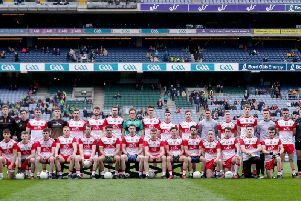 Banagher: Daryl McDermott; Shane Murphy, Ruairi McCloskey, Oisin McCloskey; Paul Cartin, Sean McCullagh, Darragh McCloskey; Brian Og McGilligan, Mark Lynch; Gavin O'Neill, Peter Hagan, Conor Feeney; Niall Moore, Shane Farren, Tiarnan Moore. Steelstown Brian Ogs: Martin Dunne; Eoghan Concannon, Kevin Lindsay, Shane O'Connor; Neil Forester, Liam Heffernan, Dairmuid Baker; Darren McDaid, Ryan Devine; Emmett Deane, Ben McCarron; Gareth Logue; Jacob Duffy, Mark Foley, Mickey McKinney.